Let me start with a disclaimer: I am not a fan of change, especially when it has to do with Walt Disney World. Walt Disney World has decided to start changing the costumes for the cast members around the World Showcase. The first to get the new costumes is the American Pavilion. Disney has mentioned that they want the World Showcase to be more modern and not have guests view the pavilions as a museum. The theming before the new costumes had Colonial America styling. 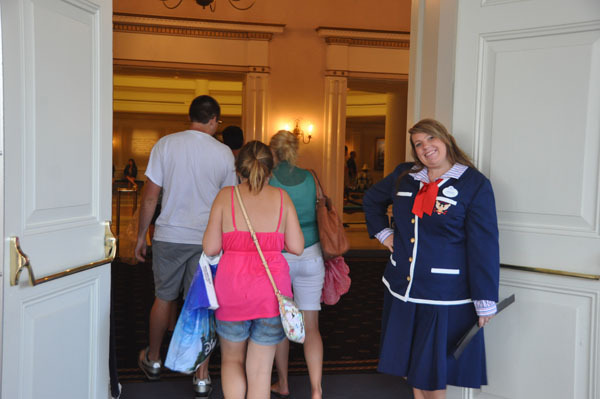 The new costumes to me look like the ones at Soarin’ or outdated flight attendants. Nothing says America like these new costumes to me, wrong! At least they kept the red, white, blue of America. One of the things that hooked me about Walt Disney World was their attention to detail. These new costumes don’t tie into the American Pavilion at all. They don’t give me the same feeling that the old colonial costumes do. What is next, are they going to retheme the pavilion to appear as a modern representation of America? What is wrong with remembering the past? What do you think? I think it is going to take a long time for these new costumes before I like them. I can’t wait to see what they do with the rest of the costumes in World Showcase. I hope they think twice before they change them to represent a more modern image!